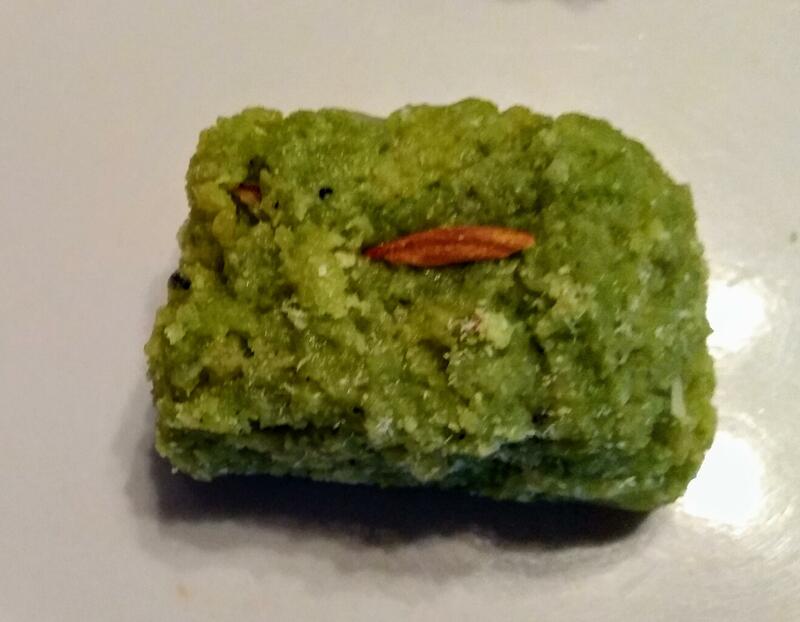 This Burfi is made using either freshly shelled or frozen peas. If using fresh peas, boil them in water, until soft. Drain. Grind/blend peas without adding waterand press through a sieve to remove and rough bits..
Heat ghee in a pan, add blended peas and stir-fry for 2-3 minutes. Turn heat down. Add sugar and milk powder, continue stir frying until smooth and the whole mass begins to come off the pan. Add and mix chopped nuts, and dessicated or fresh grated coconut. Spread a thin film of ghee on the tray. Pour out the pea and milk mix onto this tray. Spread it out into a thickness of 1/2 inch. Cut into squares or diamond shapes. Decorate with one chopped almond or cashew nut on each birfi. Store in an airtight container in a fridge. When cool, cut into squares or diamond shapes. Store in a closed container. It will be fine for around a week.